Wild Hare Farm is a small farm in Cedar Grove, North Carolina. The farm is 30 acres, with approximately one and a half acres in cultivation. 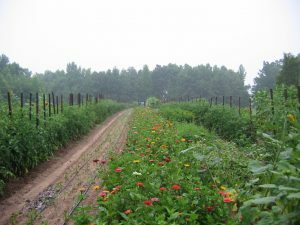 They produce a wide variety of specialty cut flowers, vegetables, and strawberries. All crops are grown using natural and sustainable methods. Wild Hare builds and maintains soil health through crop rotation and cover crops.